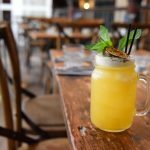 Nottingham will be all shaken up when Nottingham Cocktail Week takes place in the city centre from Monday 3 September to Sunday 9 September 2018. With over 55 venues having already confirmed their commitment to taking part in the seven day festival, Nottingham Cocktail Week is set to be a vibrant celebration of the city’s unrivalled cocktail scene. For the event, venues have been encouraged to create three new cocktails based on three different themes. The first of these is a collaboration with another Nottingham business, the second needs to be inspired by a Nottingham personality and the third is a twist on a classic cocktail. Participating businesses can create entries in just one or all three categories and will compete head to head in a competition to arrive at a winner in each category, with some great prizes for the three successful teams. People will be able to view these special creations ahead of Nottingham Cocktail Week on the digital menu at itsinnottingham.com/cocktailweek and all cocktails will be available for people to enjoy during Cocktail Week. A trail map is being produced to show the venues taking part and there will also be details of any special events and offers. People will be able to pick up a map from venues around the city and at other central points. It will also be available to download from the It’s in Nottingham website. In addition people will be enter a competition on It’s in Nottingham social media by sending in pictures of their cocktails and using the hashtag #NottmCocktailWeek to be in with a chance of winning a prize every day throughout the week. Pubs, bars, restaurants, hotels and casinos will be taking part in the event and among them are Boilermaker, CookieShake Bar, Pepper Rocks, Hockley Arts Club, The Alchemist, The Walrus, Harts, Bar Iberico, Chino Latino, Jamie’s Italian, St James Hotel and The Lace Market Hotel and Bodega. For further information on the event visit: www.itsinnottingham.com/cocktailweek.